Hard cuts from Kyle Korver and Derrick Favors free Joe Ingles for your Heads Up Play of the Day! 2013-2014 SEASON: Scored in double-figures five times during the postseason, including one 20-point effort ... Saw a playoff career-high 45 minutes of action @Ind (5/3), scoring 19 points and tying his playoff career-high with five 3FGM ... Set or tied postseason career-highs in rebounds (nine) and 3FGM (five) on 4/28 @Ind ... Scored 15 points and grabbed a playoff career-best nine rebounds v/Ind (4/26) ... Ranked first in the NBA in 3FG% and 12th in 3FGM (185) during the regular season ... Scored in double-figures 42 times (seven 20-point outings) ... Made five-or-more 3FGs in a game seven times ... Reached season career-highs in assists per game and FT% ... Led the team in scoring eight times, assists five times and rebounding on three occasions ... Led the club in 3FG%, 3FGM and minutes per game, while ranking fourth in points and steals per game ... His 127 consecutive games (11/4/12-3/2/14) with at least one 3FGM is an NBA record (broke Dana Barros’ mark of 89 v/Cle on 12/6) ... Knocked down all six of his three-point attempts @LAL (11/3) en route to 22 points, tying Mike Bibby (12/21/08) and Al Harrington (12/26/05) for the most three’s made by a Hawk in a game without a miss ... Converted seven four-point plays on the year ... His 185 3FGM ranked fifth on the club’s all- time single season list ... Missed four games due to a rib contusion (11/27-12/2) and six due to back spasms (3/21-3/29) ... Re-signed with Atlanta on 7/12. 2012-13 SEASON: Compiled 10.9 points, 4.0 rebounds, 2.0 assists, 1.0 steals and 0.5 blocks in 30.5 minutes (.461 FG%, .457 3FG%, .859 FT%) • Finished second in the NBA in 3FG% and fourth in 3FGM (189) • Made at least one threepointer in his final 73 games of the season, the longest active streak in the NBA, a career-best and the fourth longest streak in league history (Dana Barros 89, Michael Adams 79, Dennis Scott 78) • His 189 made three’s was the fourth-best single season total in franchise history • Averaged 11.4 points, 3.9 rebounds, 1.9 assists and 1.0 steals in 30.8 minutes (.469 FG%, .467 3FG%, .862 FT%) as a starter (60 games) • Scored in double-figures 42 times, including four 20-point outings • Put in 10-plus points in 13 straight games (1/16-2/11), the longest streak of his career • Poured in a career-high eight 3FGs en route to season-high 27 points v/BOS (1/25), setting the Hawks franchise record for three's in a half (eight) • Recorded four-point plays v/WAS (11/21) and @IND (3/25) • Missed four games due to back spasms (11/30, 12/7-12-10), one due to a right great toe sprain (3/4), one due to personal reasons (12/5) and two due to DNP-Coach’s Decision • SEASON HIGHS: 27 pts v/BOS (1/25), 8 rebs (2x), 8 assts @IND (2/5), 4 stls v/OKC (12/19),3 blks (2x), 9 FGM v/NYK (4/3), 8 3FGM v/BOS (1/25), 5 FTM @NYK (1/27), 45 mins v/WAS (11/21). PREVIOUS SEASONS: Has appeared in 738 career games (170 starts) in 10 seasons with Philadelphia, Utah, Chicago and Atlanta, and holds career averages of 9.6 points, 2.9 rebounds and 1.6 assists in 24.8 minutes (.434 FG%, .419 3FG%, .875 FT%) • Ranks sixth among active players in 3FG% (.419) and 17th (29th in NBA/ABA history) with 1,323 3FGM • In 2009-10, led the NBA in three-point shooting at .536 (59-110 3FGM), establishing the NBA single season three-point shooting record • Led the NBA in free throw percentage and ranked ninth in three-point percentage in 2006-07 • Has missed 47 career games due to injury, with 26 of them coming in 2009-10 • Appeared in 65 games (seven starts) with the Bulls in 2011-12, and averaged 8.1 points, 2.4 rebounds and 1.7 assists in 22.6 minutes (.432 FGs, .435 3FGs (10th in the NBA), .833 FTs) • Ranked 10th in the NBA with 118 3FGM • In 2010-11, for the third time in his career, appeared in 82 games (all off of the bench), and averaged 8.3 points, 1.8 rebounds and 1.5 assists in 20.1 minutes (.434 FGs, .415 3FGs, .885 FTs) • Was 17th in the NBA from long range • Appeared in 52 games with the Jazz in 2009-10, and averaged 7.2 points and 2.1 rebounds • Led the NBA in three-point shooting at .536 (59-110 3FGM), setting the NBA single season three-point shooting record • In 2008-09, appeared in 78 games (two starts), and averaged 9.0 points, 3.3 rebounds and 1.8 assists (.438 FG%, .386 3FG%, .882 FT%) • Split time between the 76ers and Jazz in 2007-08, and posted 9.9 points, 2.3 rebounds and 1.3 assists in 75 games (all as a reserve) • In 50 regular season games with Utah, the Jazz went 38-12 record (was 16-16 prior to his arrival) • In his last full year in Philadelphia (2006-07), appeared in 74 games (one start), and averaged a career-high 14.4 points • Led the NBA in free throw percentage and ranked ninth in three-point shooting • In 82 games (43 starts) in 2005-06, tallied 11.5 points, 3.3 rebounds and 2.0 assists in 31.3 minutes • Shot .430 from the field and .849 from the free-throw line • Ranked fifth in the league in three-pointers made and 11th in three-point percentage • In 2004- 05, appeared in 82 games (57 starts), and averaged 11.5 points, 4.6 rebounds and 2.2 assists • Set the Sixers record for three-pointers made (226) and attempted (558) • Led the league in three-pointers made, and ranked among NBA leaders in attempts (third) and percentage (18th, .405) • As a rookie in 2003-04, averaged 4.5 points and 1.5 rebounds in 74 games (.352 FG%, .391 3FG%, .792 FT%). COLLEGIATE CAREER: Averaged 14.1 ppg and 5.2 rpg, while hitting .453 from the three-point line in four years at Creighton (1999-03) ... Appeared in 128 games ... Was named Second Team All-America by Associated Press following his senior season, and received Honorable Mention All-America honors from the AP as a junior ... Finished his career as the school and Missouri Valley Conference (MVC) leader with 371 three-pointers, which was tied for sixth in NCAA history at the time ... Wrapped up his collegiate career ranked 14th in NCAA history in three-point field goal percentage (.453) and ninth in free throw percentage (.891) ... Ranked fifth all-time at Creighton in scoring (1,801) and first in three-point field goals made, three-point field goals attempted, three-point field goal percentage and free throw percentage; eighth in assists; ninth in blocks and fourth in steals ... Became the first player in school-history to appear in four consecutive NCAA Tournaments ... Became one of six players to repeat as MVC Player of the Year (joining Larry Bird, Hersey Hawkins, Xavier McDaniel, Lewis Lloyd and Junior Bridgeman). PERSONAL: Recipient of this year’s Jason Collier Memorial Trophy, awarded annually to the individual who best exemplifies the characteristics Collier as a community ambassador ... Born in Lakewood, CA, and grew up in Pella, Iowa ... Married to Juliet Korver, and they have a daughter, Kyra ... Parents are Kevin and Laine Korver, and he has three brothers: Kaleb, Klayton and Kirk ... Klayton played collegiately at Drake, Kaleb played at Creighton, and Kirk plays at Missouri-Kansas City ... His cousin Kari plays at UCLA ... Kyle’s father, mother and two uncles played at Central College in Pella, Iowa, and his mother once scored 74 points in a high school game ... Owns Seer Outfitters, a clothing brand which donates 100% of its profits to support organizations and causes throughout the country ... Was a 2013 finalist for the NBA’s J. Walter Kennedy Citizenship Award ... 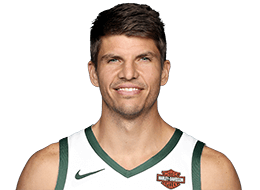 Established the Kyle Korver Foundation in 2006 while in Philadelphia, and has held several coat drives during his career ... Hosted a holiday party with the USO and the Chicago Housing Authority ... Held an assembly with more than 100 students from the Walt Disney Magnet School in Chicago, to encourage the students to excel in their studies and to help maintain superior attendance records ... Has participated in the NBA’s Basketball Without Borders program, most recently going to India in the summer of 2008 ... Had his No. 25 jersey retired by Pella High School in 2006 ... Majored in Visual Communications at Creighton ... Is an avid golfer, and competed in the 2008 and 2009 Utah Opens on sponsor exemptions ... Other hobbies include ping pong, bowling, horseshoes, croquet, pool and Frisbee golf ... Is on twitter @KyleKorver.